Hello there! I hope I am not sharing too many of my cards here lately, I just can’t seem to stop making them! Today I’d like to share a card I created using STAMPtember Newtons Nook exclusive stamp set – Bushels of Love! 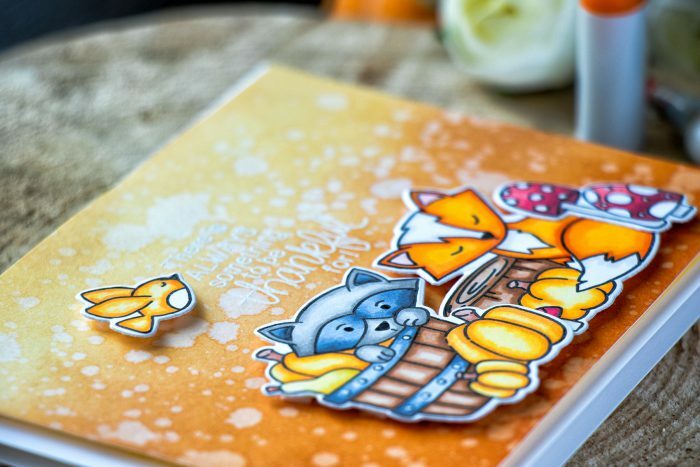 This is another new-to-me stamp company and turns out they have such cute and fun designs! I usually try to stay away from critter images as I don’t feel I am good when it comes to coloring, but recently I’ve gotten a few new Copic marker colors and a Hex Chart by Sandy Allnock which has been very helpful so I’ve given alcohol marker coloring another go! I’m happy with the way these images turned out, I think I’ll be using my Copics more now. 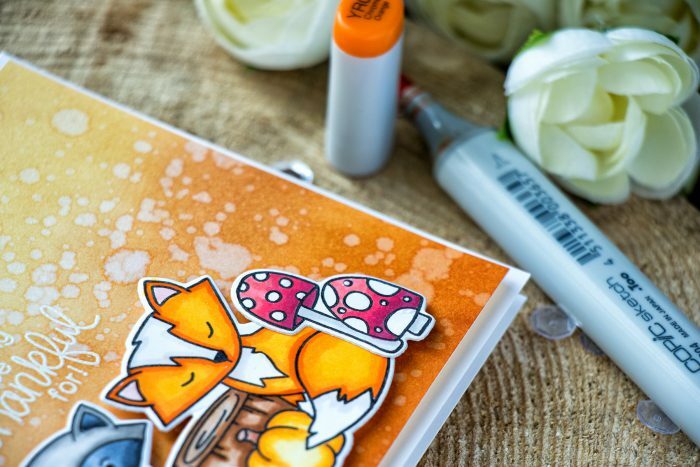 I used Simon’s Intense Black ink for stamping and stamped critters onto Copic X-press it paper. There are coordinating dies available, so I cut my images out using those after I’ve colored them. To create a background I used several colors of Distress ink and blended Rusty Hinge, Tea Dye and Scattered Straw onto Neenah Solar White cardstock and added lots of water drops using my Distress Sprayer bottle. I heat embossed a beautiful “There is always something to be thankful for” sentiment in white embossing powder and foam mounted this panel onto an A2 top folding landscape card. I didn’t add any sequins or beads or anything else to this project as I liked it just the way it was, I did however use my white pen to fix some of my coloring mistakes. Hi Yana, Love the wreath that you made. 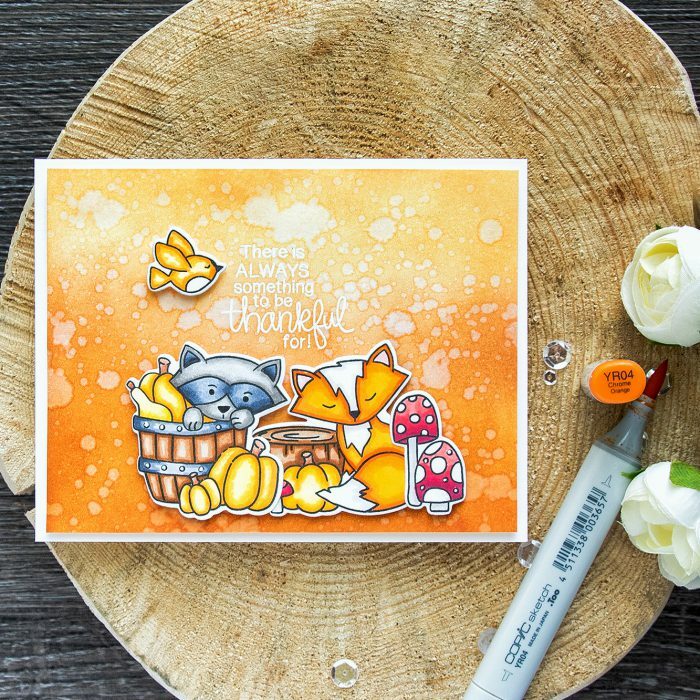 But I love the critter cards they are so cute, just love them. You do beautiful work, it’s great to see what you’ll do next. Again thank you for sharing. Newtons stamps are so adorable! Look at these cuties! Such a lovely card! Love the background and coloring! Oh Yana, this is SO, so cute. 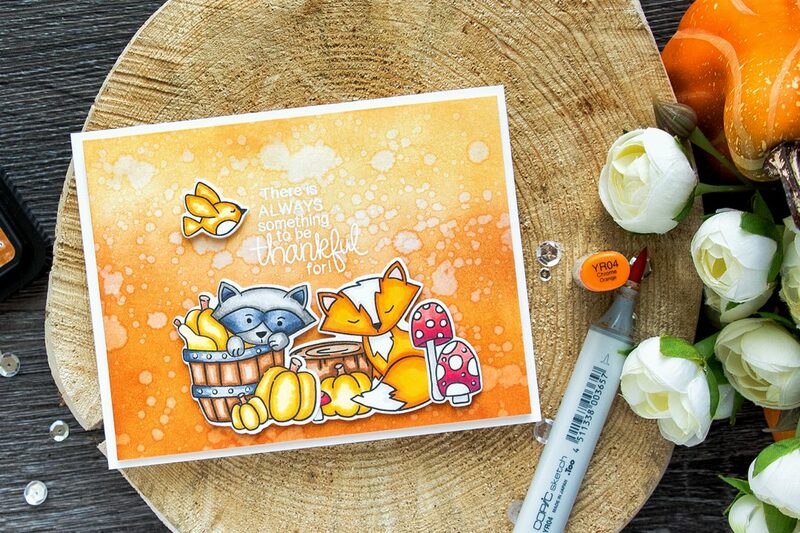 Love the background and those cute ‘critters’ are coloured beautifully!